For each issue of the TJNL, we have a swap -- and the cards are fabulous! (The gallery of swaps is here.) I almost always make a card for everyone in the swap. Well, that is not really true -- I usually make three cards or more, and each uses a technique from the NEXT issue, so everyone gets a sneak preview. I love doing these swaps (oh heck, I just like swapping in general). It is hard sometimes, though, since the swaps get 35 people or so each time -- and time is always an issue for me. I give these cards a high priority -- I am committed to making those cards each time!!! Two of the cards I made for the August swap are here. The one on the right uses the Marker Wash Technique -- these Close To My Heart stamps are perfect with the technique. The second card (on the left) uses the Cuttlebug Smoosh Technique -- something I have done in the past two posts. Are you sick of it yet? I'm not! That card uses all Stampin' Up! stamps. October marks the 5th year anniversary of the Technique Junkie Newsletter -- and I will be having a GIVE-AWAY-A-DAY every day during October! Watch my blog, my website and the Technique Junkie Newsletter e-groups for details. I have approximately $750.00 in stamps, gift certificates and merchandise from various vendors to give away! Join in the fun -- it all starts tomorrow! This weeks' Blogger's Challenge called for us to use a Rainbow or Spectrum pad. I chose to make mine using the Cuttlebug Smoosh technique from the October/November issue of the Technique Junkie Newsletter. I love the technique -- it is sinfully easy! Stamps & Beads: Club Scrap. To take the rainbow theme even further, I dyed the flower to match. 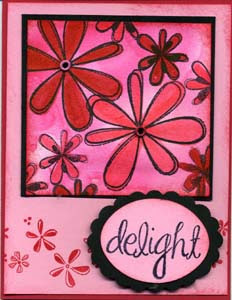 I used a flower from the "Pretties" kit fom Stampin' Up!, but you can use any white or neutral-colored flower with the same result. Ink brayer with rainbow ink. Starting in the center of the flower, brayer the color on the flower by rolling the brayer back and forth. Continue until flower is colored as desired. To add contrast and to fill in any white space left from brayering, use the Aquapainter to pick up some of the lightest color of ink. If preferred, smoosh some ink into the plastic lid or a sheet of acetate, and pick up the ink from that. 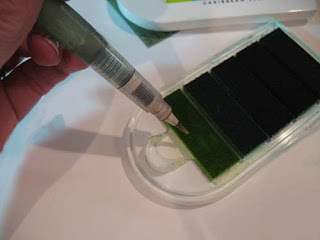 Paint the center of the flower petals with the ink using the waterbrush. Allow to dry before using on cardstock. Make sure to check out the other Blogger's Challenge cards -- links to this uniquely talented group are in my sidebar. Do you like the way the Cuttlebug Smoosh technique looks? Subscribe to the newsletter! The $33.00 special ENDS on September 30th -- hurry before the offer is over! I am excited about this week's Blogger's Challenge -- not only because I like my card, but because it is a sneak preview of TWO of the upcoming techniques in the October Issue of the Technique Junkie Newsletter! The front panel uses a new Technique called "Marker Wash". Hope you like it! If you are a TJ member, know that the newsletter will be mailed on Wednesday of next week -- many of you will have them by next weekend! In any case, check out the inspiring challenge cards from the other Blogger's Challenge members. All of their blogs are on my sidebar. Don't you just love the variety produced by the BC members? I am going away this weekend with my friends on a scrapping retreat in PA - I am so excited! I can't wait for the 48 hours of creative time that awaits. I cherish my scrapping friends and I wanted to give each of them a little something. I was tipped off about these cool cans from my friend Sue D a while back -- they were in a clearance bin at Staples for an unbelievable price. I snatched up every one of them --- I knew I would find a good use for them, and so I did! 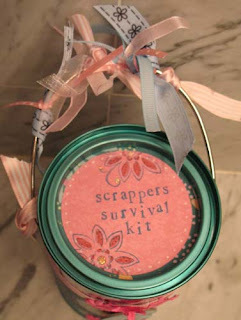 I made these little "Scrapper's Survival Kits" - one for each of my friends. 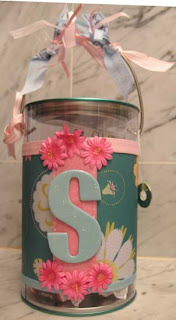 I found this pretty paper in my stash -- it matched the teal tops perfectly -- and added a few Prima's, a chipboard initial, a bunch'a ribbons, and a snippet of stampin'. I sure hope the girls like them! Each has an assortment of items in them -- a package of tissues, some mints, a mini stamp set, a package of glitter, some rub-on embellishments, a glue stick, and the most essential item, some chocolate. Hope you all have a great weekend! I will share what I do when I get back. It's Blogger's Challenge Friday Again! This week we were charged with finding something around us to inspire our artwork. This week I chose to recreate one of the prints from my Living Room Fireplace. These prints are so graphic -- I have always liked them...and have long thought that I could recreate the look of them with stamps. On the left is the print I was recreating, and the right is my creation. 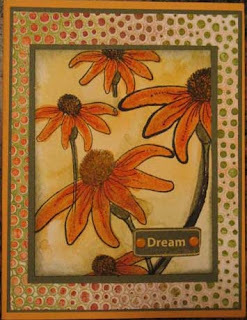 When I started, I thought that I could really make it interesting by using mulberry paper and batik to recreate the look by layering them onto card stock. Then it hit me -- the real challenge for me would be to create the look on one sheet of background paper with masking. I am thrilled with how this came out. When the white glossy was fully covered, I mounted it on tan paper, then embossed a "mat" around the vanilla with the ScorIt Tool. I then trimmed it very close to the embossing, and mounted that on deep burgundy paper to mimic the frame. I am so happy with this! Make sure to check out the other inspiration pieces from the players in the blogger's challenge in the list on the left. I hope you are inspired today!! Just a quick card to share...I made this for a recent Halloween swap. I usually don't make much for Halloween, but I just love this little circle set and the designer papers. All supplies: Stampin' Up!. I helped DH paint the deck today...I had greay and white paint all over my body -- why can't I be neater when I paint? Oh well, the paint thinner removed the leftover ink on my fingertips, so it's not all bad... Hope YOUR weekend is great! 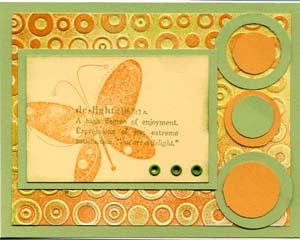 This week's Blogger's Challenge was to use this layout for card inspiration. Well, I just couldn't get this Close To My Heart set and Papers out of my mind! I hope you enjoy my interpretatio0n of the layout. Make sure to check out the other cards from the rest of the Blogger's Challenge group -- the talent in this group is amazing! Their blogs are on my sidebar. The card above is another challenge card (I guess I really like challenges!). The idea was to use at least one of the new punches from the 2007-08 SU catalog. Since my Circle Scallop Punch just died (wahhhhh), I chose to use the 5-Petal Punch. After realizing that it doesn't work with some of the sets I own -- I think SU needs a 6 petal punch -- I decided to make Poinsettias! These are very easy -- Just punch the flower twice, then edge with white ink -- then stack. I pushed gingham ribbon through the holes on the clear buttons. This was no easy feat, and I have tiny holes all over my fingertips from pushing the ribbon through the button holes! Good thing the gingham was RED! After ruining all the nerve endings in my finger tips, I layered the buttons on top of the flowers. I hope this is a new way for you to use your 5-petal punch, too! I made Rose some poinsettias, too. I put some gems in the center of hers. I hope she likes them! I have to say I am certainly getting my money's worth out of my punches this year -- I used 8 of them to make Rose's Candy. 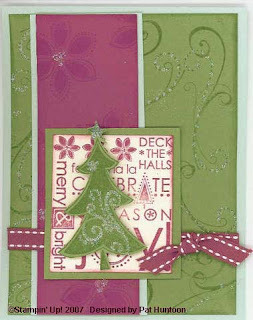 Since I am on a Christmas theme in this post, I thought I would show this card I did for a recent swap. Don't adjust your screen colors -- this one is in Pomegranate and Green instead of the red and green above. It looks a bit washed out here, but it is prettier in person, I think! Get two years of the Technique Junkie Newsletter at 2004 prices! Get the 2007 and 2008 Technique Junkie Newsletters for just $33.00 (US addresses only). You will receive a whopping 150 techniques delivered to your doorstep. TJ techniques are step-by-step -- not an overview -- and the newsletter itself is full-color, professionally printed and high-quality. In addition, you have online-access to the step-by-step picture tutorials online -- and GREAT artwork from talented designers. No-one has more tutorials than the Technique Junkie Newsletter. With our 5 years of publications, we have an archive of nearly 400 Rubber Stamping Tutorials -- and so many more to come! I recently ordered quite a few stamps from Close To My Heart, and I am using them almost every day. Unfortunately, they are being used for artwork for the next two newsletters, and I just can't show you that right now! In the meantime, I was just playing around and came out with the card on the right. I hope you like it! I used a modified Milkpaint Technique for the burgundy section of this card. The Milkpaint technique was covered in the TJ Newsletter a few years ago, and I have a Free Tutorial for the technique HERE. The file is a .pdf -- it is in the format that the TJNL CDs are in. Enjoy the tutorial! Oh, I keep forgetting to post this -- I am adding a Close To My Heart Gallery this month to the http://www.patstamps.com/ website, so keep your eye out for that. I am also in the midst of the 1,000 update to the Stampin' Up! Current Set Gallery (and the ATC Gallery, too). I will announce the updated site areas here as I complete them.